Two years back we saw the story of Starbucks price increase. Despite widespread criticism in the news media we saw no real ill effect on its sales or brand. You know why from here (elasticity) and here (demand curve shifts). Now they are rolling out price increases to the rest of the country. I want to point out some key points noted in the price increase story that serve to tell us how well they are executing this change. Here is the link to Reuters story if you want to read it without my interpretations. Starbucks Corp (SBUX.O) raised prices by an average of about 1 percent in the U.S. Northeast and Sunbelt on Tuesday, making coffee-drinkers spend more in New York, Boston, Washington, Atlanta, Dallas, Albuquerque and other cities. Average price increase is meaningless. They want us to focus on the small number. Most likely some prices went up much higher then 1%. You won’t find that until you read the story. Most likely they also calculated the average over all their products, even those that did not see price increase, simply to bring down the average. They are giving reason for the price increase. As William Poundstone, author of Priceless wrote in a guest post for this blog, customers are more likely to find the price increase acceptable if associated with a fair reason. Starbucks is going a step further in using examples, “hey others already did it and we are following them”. You should give them credit for both points and extra credit for giving future cost increase as the reason. This further attests to first point, not all prices are going up. Most likely they are increasing prices of their most popular drinks, those whose demand is relatively inelastic or those with lower contribution margin such that they are okay with lost sales from price increases. For the last point see my past post on how lower contribution margin means okay to lose sales from price increases. To state the obvious, Starbucks has three sizes, tall, grande and venti. They are increasing prices on their tall while leaving the grande untouched. This is classic case of second degree price discrimination. After the price increase on tall, some customers may find they get more value with grande (higher consumer surplus) than they get from higher priced tall and will instead choose grande. Since the marginal cost of additional coffee in grande is almost negligible this is still an upside for Starbucks. They are able to capture higher consumer surplus without alienating their customers. Because they have done their versioning right. A key attribute of those practicing value based pricing is never explicitly saying that they are practicing value based pricing. There are always other reasons and you never say pricing at customer willingness to pay. A key part of practicing effective pricing is effective pricing communication and managing customer perception. Failing that you will face backlash as some brands recently did. Overall, great pricing strategy, execution and communication by Starbucks. Observations on iMac Pricing – A case of well executed versioning? Take a look at the pricing of the two lowest priced iMacs. 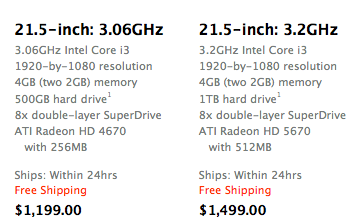 Apple charges $188 for upgrading CPU to next level and $141 for the Disk upgrade. So why doesn’t the Apple offer these customizations for the lowest priced version? Are they leaving money on the table by not meeting the demand by not asking “Do you want to supersize it for just $141 or $188?”? There is nothing new or Apple magic here. This is a case of second degree price discrimination (versioning) executed very well. The other possible reason is, this isn’t by deliberate versioning design at all but a random scheme chosen by one of the product managers. But I am 70% confident it is the former. How do you set your version prices?